Mkts down on F&O expiry, Fed hint .The markets have closed lower for the fourth straight session on Thursday as the blue-chips down after US Fed meeting saying no change in its plan for interest rate hike timing in December. Mumbai: The markets have closed lower for the fourth straight session on Thursday as the blue-chips down after US Fed meeting saying no change in its plan for interest rate hike timing in December. 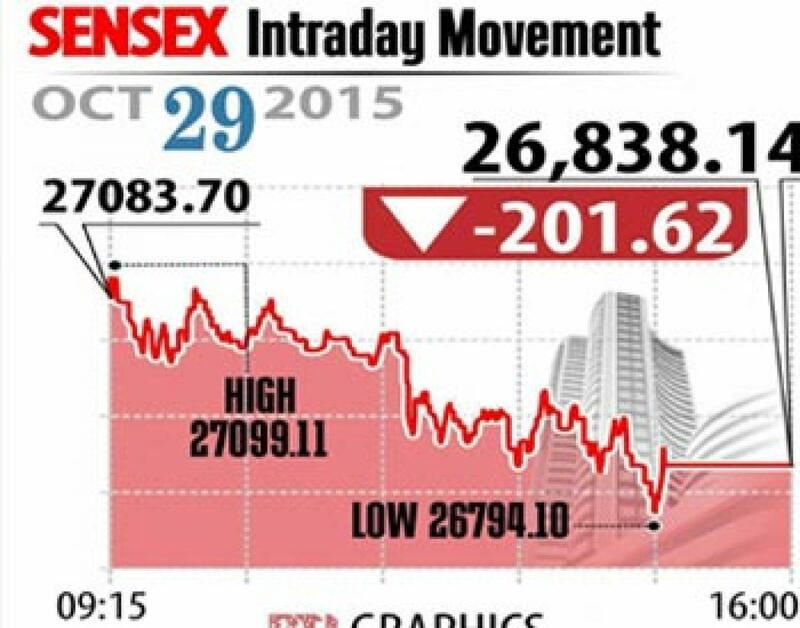 Sensex ended 202 points down at 26,838 and Nifty dipped 59 points to close at 8,112 levels. Meanwhile, the broader markets followed the trend with midcap and smallcap indices down by 0.4 per cent each. Experts see extreme volatility and even decide the trend for November series as outcome of Bihar elections are expected in the next week. On the sectoral front, sectors like FMCG, bankex metal, oil & gas and power indices fell over 1 per cent each, however, consumer durables index gained at 0.4 per cent. With Reliance Jio planning to raise Rs 3,000 crore by debenture issue, RIL gained 0.5 per cent, while Sun Pharma fell by 2.4 per cent after the company initiated recall of anti-allergic drug from US market. On the earnings front, Dr Reddy gained 2.6 per cent as the company reported better financial results, similarly, Yes Bank ended 2 per cent higher. On the contrary, NTPC shares lost over 1 per cent even after the company reported about 40 per cent up in its net profit. MRF share also closed lower, though the company reported over 45 per cent surge in its net profit. The gainers: Dr Reddy's, up 2.59 per cent at Rs 4214.05; Vedanta, up 1.71 per cent at Rs 106.85; and Tata Motors, up 1.36 per cent at Rs 391.25. The losers: BHEL, down 4.38 per cent at Rs 203.25; Axis Bank, down 2.81 per cent at Rs 469.40; and Sun Pharma, down 2.36 per cent at Rs 879.70.